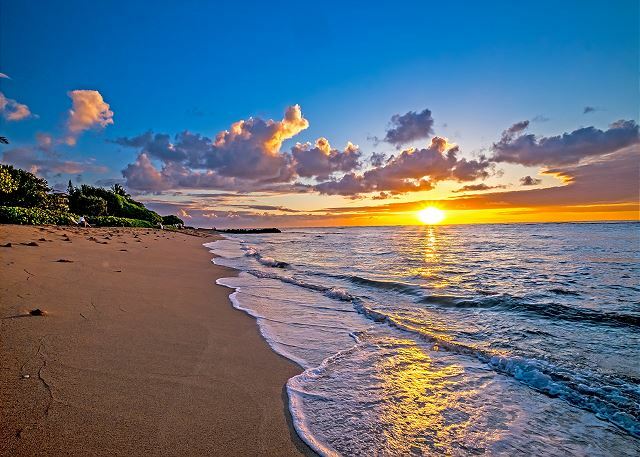 As a guest at Waipouli Beach Resort G-306 & RE/MAX Kauai, you'll have access to Kauai's Premier Concierge Service at (855) 665-2824 http://kauaiva.com/index.html, we will help you build your perfect vacation. We were very happy with our accommodations/condo G306 at the Waipouli Beach Resort. 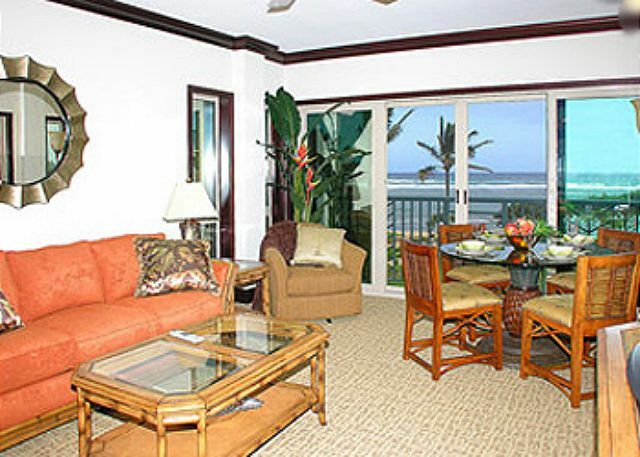 The condo has a great unobstructed view of the beach and we loved being able to hear the ocean. The condo was well stocked. The only suggestion I have is that the dining room chairs seats are either cleaned or re-upholstered. We loved the Oasis Restaurant and their Spa services are superb. Our vacation was wonderful, the condo was great except it could use a little updating! The views were amazing! The grounds were spectacular. We did have an issue by the pool where as we woke up early to get "our spot" only to find out that it was moved and our towels were relocated by the towel staff. There were loads of open chairs and spaces for other guests who could of easily claimed their spot for the day. Didn't appreciate them changing our location. Did notice other people put down their towels and they weren't moved. Nice place, don't expect to use the beach out front. a guest from Canoga Park, CA does not recommend this vacation rental. The place appeared nice upon check in. Great view and nice looking place. A few things that we wish could have been better. The air conditioner is super loud and turns on and off every 4-5 minutes. Makes it difficult to sleep. If the bedrooms had ceiling fans, we could have turned the AC off. Lanai chairs are old and actually falling apart and give you splinters. Also the travertine on the Lanai is disintegrating and is sharp and super hard on your feet. TV's in the unit were old, no smart TV's. When traveling with kids it would have been nice to login to netflix in the evenings. We also arrived to some dirty dishes in the dishwasher. All in all it was still a nice stay, it just could have been better. Good location. Comfortable and clean. Stress-free and well-organized check in and check out. Beach great for sunrises. Pool was fantastic. Was perfect for my group- myself, my wife and my in-laws. Plenty of room for 4 adults. More than that might be a little tight. 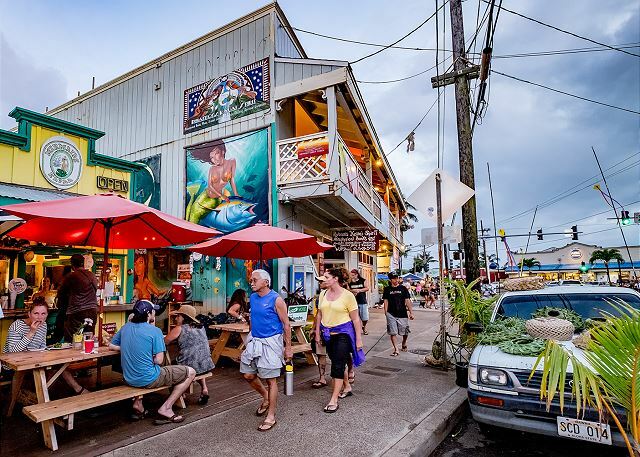 It was a great location close by downtown Kapaa. We rented bikes that we used on the paved pathway right along the ocean. (Which leads to downtown) The place was clean with several balconies with ocean view. The keypad was nice to not have to keep track of the keys. Oasis restaurant is right on the beach and delicious. I would highly recommend this place. Beautiful views from this well maintained and nicely appointed condo. Great island location and very convenient stores and restaurants directly across the street. The condo was clean and comfortable, very spacious. Kitchen was clean and well-stocked. View from the living room and bedrooms is amazing! 2nd bedroom closet was stocked with beach chairs, boogie boards, and misc. sand toys. We had the best time. This resort and accommodations were gorgeous! The condo was very well appointed, and the kitchen well stocked with anything you would need to get through the week. With a Safeway right across the street, it was easy to cook 'at home' and still have many great dining you options readily available. The location of the resort s perfect... smack in the middle - so great whether you want to head north or south any day! The rest pool was fantastic and we thoroughly enjoyed our visit! 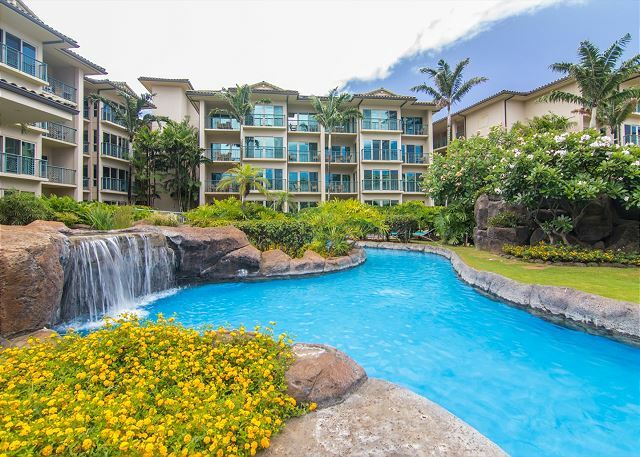 Best condo we've rented in Hawaii - any island! The apartment is excellently appointed and it was spotless. Loved the kitchen appliances. Made cooking a pleasure. From one of the bathrooms (there are 3!! ), you can open this window and watch the ocean from the tub. Nice touch!! The Waipouli resort is really nice too. The pool is pretty splendid. 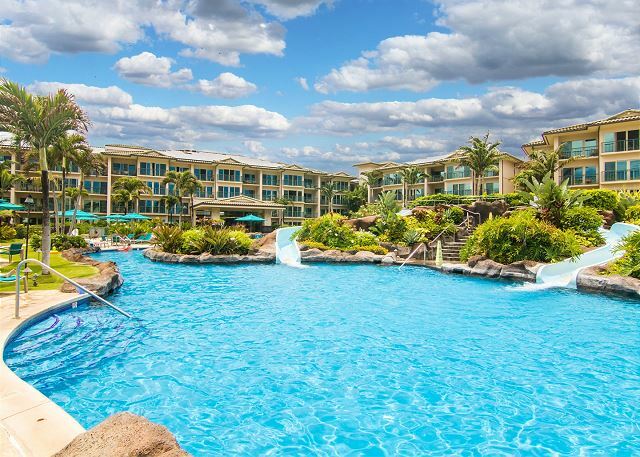 Has waterfalls, slides and numerous sandy bottom hot tubs. We loved it. 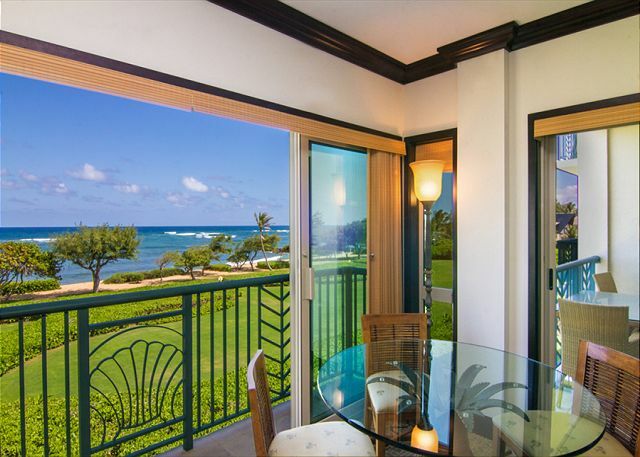 Though you are right in the middle of busy Kapaa, from this apartment, you can't hear a thing except the ocean. And having the supermarket right there was actually handy :) We loved staying there and will definitely try to stay there again on our next visit! 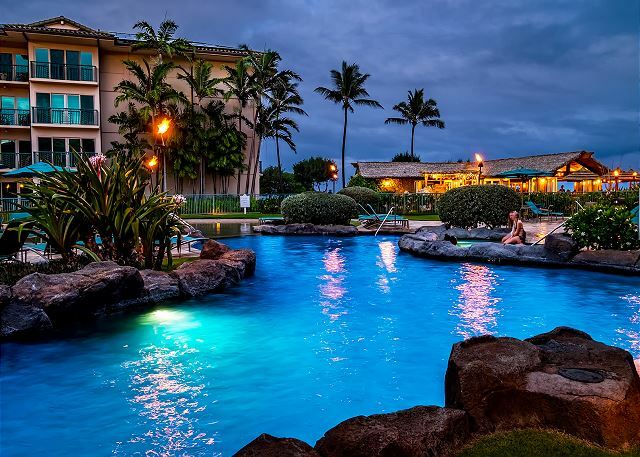 Chose Waipouli Beach Resort by chance and it couldn't have been a better choice. We were in Kauai visiting a relative, and whenever we came back to our unit, it was like coming home. Totally comfortable; beds were extremely comfie, and I am a bath person and the tub was heaven. Thoroughly enjoyed the slides at the pool (and we are in our late seventies!) Waipouli is a great location. Convenient to anywhere on the island. Great location, spotlessly clean, excellent appliances, spectacular view!! The resort itself was well managed, landscaping/pool/staff all excellent. Oasis Restaurant on site was awesome. I would book this unit again for sure! The condo exceeded all expectations and all I can say is that the pictures don't do it justice. The rooms, the kitchen, how it is equipped (towels, kitchenware, things for the beach), the bathrooms, the resort pool, the beach beneath the unit... all a perfect 10. Highly recommended! We've been to Kauai a few times in the past and have stayed at various places around the island. We loved this property based on the location and great views of the ocean and layout and highly recommend it to others planning a trip here with their family. 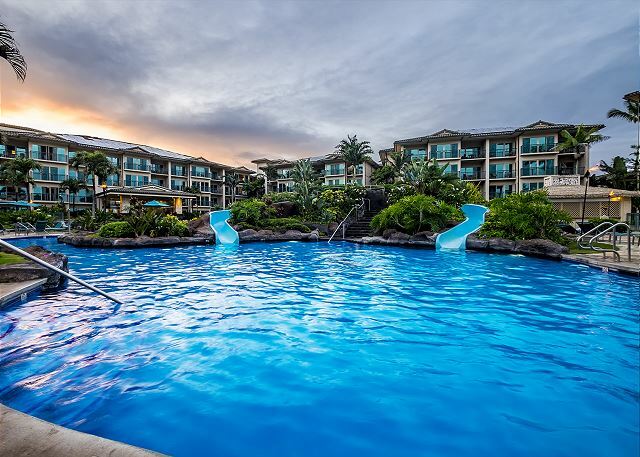 We particularly enjoyed the amenities including the beach chairs and boogie boards as well as the easy access to Safeway and Foodland just a short distance away (without feeling like it they're in your backyard). The condo was great with an excellent view. We enjoyed our stay. REMAX and the concierge were very helpful. This suite was beautiful, clean, classy, huge, well-stocked, bright, cool, modern, and has a view of the lovely grounds and ocean from 4 sets of sliding doors (yes..four! )The rental experience with Remax was easy; lots of communication in advance. This was the best condo I have stayed in EVER, and I've been to the islands 6 times. Convenient location across from Safeway and ABC Store, but quiet and private on the grounds. Families stayed around the pool. The location is excellent. This is a great place to stay. Remax was very helpful. Perfect location, perfect condo, perfect vacation. The condo is absolutely beautiful and very comfortable. All the comforts and privacy of home. We can't wait to go back to this same resort. A vacation where family gets together is always nice. The weather didn't cooperate for outdoor activities so we spent a lot of time inside. A couple of comments. Because six people could sleep there - the seating didn't accommodate that number of guests. There is one sofa (2/3 people) and one chair - not including dining room chairs which are uncomfortable after a while. The table on the lanai off one bedroom was falling apart and when we arrived there were pieces from the table all over the lanai. The window covers kept coming off the track and one of the small side covers wouldn't close. The bedroom with the larger lanai had electrical outlets that need repair and of the 3 lamps in the room - only one could be plugged in and it was a very dim lamp. The bathroom lights had all different types of bulbs in them - aesthetically it looked odd and inconsistent. The grounds were very nice - the pool was lovely and the children's pool area was good. There are slides at the pool which were fun but would have been nice to be able to put a little one in your lap and slide down. Lots of slide rules.... Grocery stores and restaurants were nearby and easy to access. The room did have quite a few pool toys which was also very nice. The kitchen was quite nice and I liked the smaller sized dishwasher so we always had clean dishes. The condo was wonderful and it is in a great central location for the island. The only thing that would have made it better would be having beach towels. The location is exactly as promised. It was clean, very functional, and is steps from the beach. It has everything you need hairdryer, beach towels from the pool, beach chairs, washer and dryer in the condo and cooking equipment. The pool area is amazing! It was Perfect! We stayed in this building for the 2nd time in less than a year. Love going to sleep to the sound of waves and waking up to the same. Beautiful condo. Very nice condo with great view, easy access. Everything there for a great Hawaiian vacation - beach chairs, blender, towels, sheets, perfect view from outside table, etc. We cooked most meals and were very happy. This condo worked perfectly for our family of four. The home and related facilities (pool, grounds, etc.) were maintained beautifully. The location was perfect; equidistant from many north shore and south shore activities, thus reducing overall driving time. I have pretty high standards when it comes to accommodations and this did not disappoint. Everything was high end, functioned well, and was pleasant to come back to at the end of a busy day. Would stay again. Great place, near some good restaurants (Wahooo & Lemongrass: we had great dinners at both), and fairly convenient to everything. It was however a bit further from Poipu and all the stuff down there than I thought. Traffic gets slow through the Kapaa area. Very nice condo, and great pool too. Beach towels available near the pool. 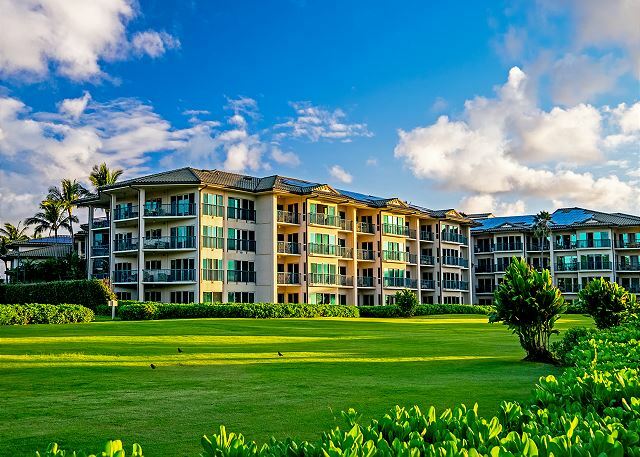 We spent 3 nights, then went to a condo in Princeville. Our family have stayed in the same property twice . We loved it both times and highly recommend it . However the sofa / lounge needs replacing as its not very comfortable & the air conditioning is noisy and inconsistent it doesn't maintain repay it'd control . Our stay in this condo was amazing. The view is spectacular and everything was clean and comfy. Very close to shopping stores: Safeway, Starbucks, Pizza, Burger, Ice-cream. We had a great stay in G-306, loving the gorgeous view and resort. A few things could use updating, like pans in the kitchen and cushions on outdoor chairs, but nothing that affected our overall enjoyment of the property. Our stay at this resort was fantastic. G306 had everything we could possibly need for a comfortable stay. Spacious, clean, comfortable beds, many extras that made us feel right at home. The view of the ocean is spectacular throughout this unit. 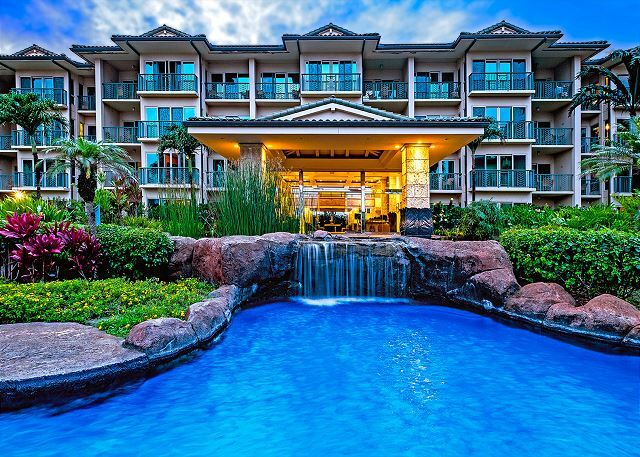 Resort is in a convenient location to shopping/restaurants and travel to experience all parts of Kauai. We will definitely be back. Thanks for an unforgettable experience! Everything Was as Advertized or Better! The unit was well appointed and spacious. The location with ocean views was outstanding. The resort amentities including the pool were equipped especially for families with children, but as grandparents my wife and I enjoyed it too. 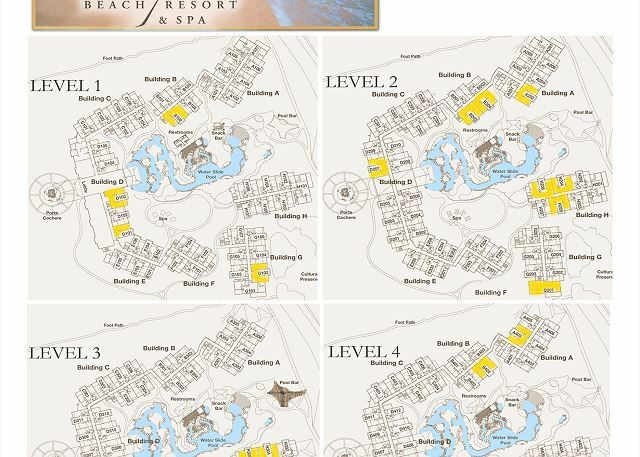 The resort location made other parts of the island very accessible. Re/Max personnel were very responsive through the whole process. Spectacular view from every window! We enjoyed our week om Kauai very much. Our condo was perfect and had everything we needed, not one complaint. It was fabulous to watch the sunrise from our balcony everyday. Loved the place so much, looking to buy a unit here! great family unit on the beach. a very beautiful location with great ocean views. The sofa bed was not adequate for our 10 year old son. I would suggest they upgrade the pullout sofa. otherwise a very nice clean unit; perfect for a family. There was only one problem. When ever we left and came back we could smell a mildew smell. The air conditioner fan would never turn off even though we set it to not be on. The only way to turn it off was by opening the windows or turning off the circuit breaker. You should probably have someone one check it out. No fault of yours but was awakened EARLY every morning to the sound of the kids above us slamming doors and pulling the patio furniture all over the place. Great place at a central location. It is important to pay the extra money to have the right location for the condominium. You don't want to view the parking lot or even the pool area. We had a beautiful view of the ocean from the 3rd floor. It was wonderful. The unit was very nice. However, it was disapointing that the bar and spa were closed and we were not notified. Otherwise, a great vacation and a perfect unit for families. Pool was great. Beach is nice but not for swimming as its a coral reef. We really enjoyed our stay...the room was fantastic. Very clean and stocked with the best appliances. When DVD player in one bedroom didn't work, they came out next day and replaced it with a new one. Wonderful view of the beach. The resort has a good Bar and Grill restaurant and fantastic pool area. Would go back any time. Unfortunately hot tubs weren't working too well when we were there. great location and very very clean! Beautiful view and excellent facility. Excellent facility. Would recommend replacing frying pans (quite used). Couldn't have been better--a perfect vacation! The unit was beautiful. However, if you rent a private unit from REMAX, the front desk cannot help you with anything as it is not their unit. This was a problem for us arranging a crib (which we never did get). Otherwise, no complaints. The garbage was always overflowing outside in the parking lot bin, pretty bad. Other than that, a great time. Shopping was nearby. Lots of restaurants to pick from. Good snorkeling within a 20 minute drive. The condo had many water accesories for you to use. I used the condo's tennis courts every morning while the air was still cool. The air conditioning in the condo could be improved since it was quite warm while we were there. Beautiful place would definitely come back again. This property is truly gorgeous, from the pool to the rooms to the tiki bar. And if you have rental car, you can get to all the best locations on the north and south sides of the island. The very small beach onsite is there if you need it, but mostly you will want to pack up and head elsewhere for real beach time. Only criticism I have of the rooms - and ours was a spacious two bedroom - is that the balconies are tiny, and thus not equipped with a lounge chair where you could read, have a drink, and enjoy the view. 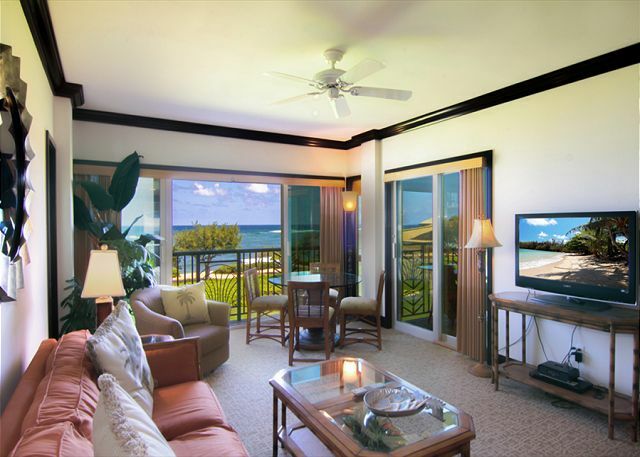 Unit directly faces the ocean with multiple balconies off master, livingroom and second bedroom. Kitchen has all the lux amenities - stainless steel, granite counter, cooking ware. Also wash/dryer. Very useful 3rd 1/2 bath as you come in the unit to the left. Pool was great for kids and shopping plaza just across the street.